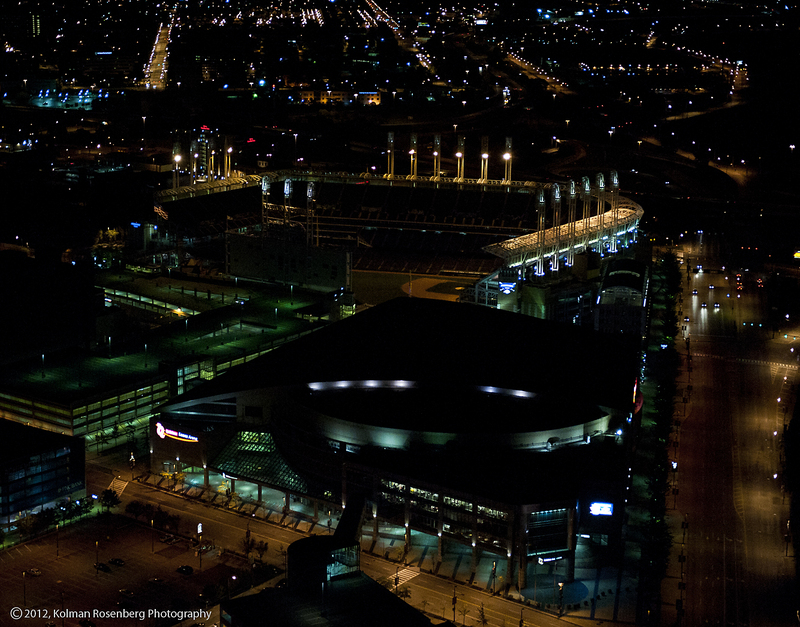 Cleveland's Progressive Field and Quicken Loans Arena sit in darkness. Looking thru last year’s photos, I found this shot, taken from the top of Cleveland’s Terminal Tower, of Progressive Field in the background and Quicken Loans Arena in the foreground. What seemed photo worthy to me was the fact that both facilities were dark. Unusual for a beautiful clear night in Cleveland. This year however, with baseball season over and the NBA at a standoff and with no games being played, this view is probably quite common. This entry was posted in Uncategorized and tagged baseball, Basketball, Cleveland, Cleveland Cavaliers, Cleveland Indians, NBA, OH, ohio, Progressive, Progressive Field, Quicken Loans, Quicken Loans Arena, Terminal Tower. Bookmark the permalink.